A diamond is just a piece of charcoal that handles stress exceptionally well. At first, the charcoal seems to have no beauty at all. Yet, underneath all the charcoal is a beautiful, shining stone. He has made everything beautiful in His time, also he has set the world in their heart, so that no man can find out the work that God makes from beginning to end(Ecclesiastes 3:11). Embrace the diamond in the making in you and those you are called to reach! Diamonds actually begin as the black carbon allotrope we know as charcoal. In the darkest, roughest places the most beautiful things emerge. Diamonds are produced through pressure, heat, and time and you need the right combination of each of these three working together perfectly to create a diamond. In the fullness of time, the pressures of life, hot situations, and long seasons of what appear to be “nothingness,” create an undeniable testimony of God’s sovereignty, power, and grace. Even after production, the beauty of the diamond is magnified with each cut, giving it the ability to reflect light, producing more sparkle and eye catching (and heart catching) brilliance as God saves us and uses others to disciple us in His Word. We are in a continual process, being beautified daily so that the light of Christ will break forth from our lives and His beauty shed abroad in us will capture the eye, touch the heart, and win the soul of mankind to Him! As difficult as it may be, embrace the diamond at work in you. God need you to sparkle for Him that the world may see HIS good works in you, and glorify the Father which is in Heaven. God is also calling you to be a diamond maker, helping others cut away all their fluff of life and become useful to the kingdom of God. Every person you connect with has a hidden diamond or treasure inside them just waiting for someone to help them shine forth (2 Corinthians 4:7). They just need someone to show them the way out. 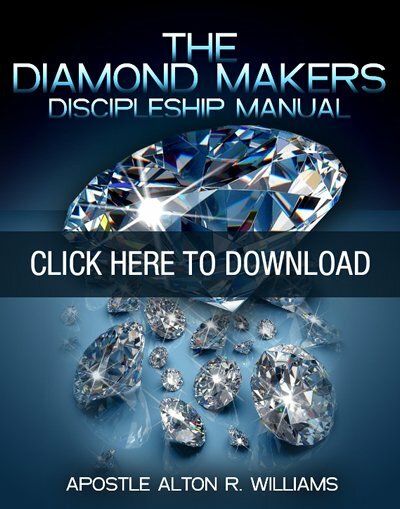 Will you become a diamond maker? And the things that thou hast heard of me among many witnesses, the same commit thou to faithful men, who shall be able to teach others also (2 Timothy 2:2). For more information about diamond makers, please contact WOOMC’s Diamond Maker Overseer Elder Sylvia Terrell at 901-844-3819 or e-mail her at sterrell@woomc.org.